by Judy Mallow. Create picturesque pine needle baskets, miniatures, trays, pencil holders and more. Special sections address dyeing needles, making lids and handles, techniques, and gathering and storing materials. “Mallow is an excellent teacher with a gift for keeping the subject entertaining and easy to follow.”—Small Press. “Beginners can create a basket by coiling and stitching together pine needles.”—Country Decorating Ideas. Paperback. Pine Needle Basketry by Judy Mallow. Create picturesque pine needle baskets, miniatures, trays, pencil holders and more. Special sections address dyeing needles, making lids and handles, techniques, and gathering and storing materials. “Mallow is an excellent teacher with a gift for keeping the subject entertaining and easy to follow.”—Small Press. 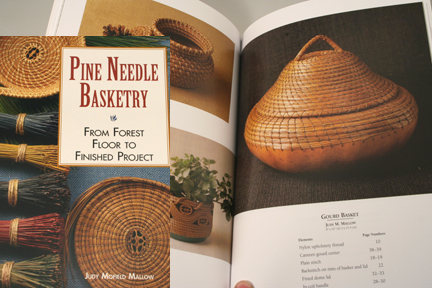 “Beginners can create a basket by coiling and stitching together pine needles.”—Country Decorating Ideas NOTE: The publisher says this book is indefinitely out of print. A classic, now out in paperbook.